Peel carrots and cut into 2 inch strips. Trim the ends and then cut the celery into 2 inch strips. Cut cucumber into 2 inch strips. Cut peppers in half and remove the stem and seeds, then cut into strips. Arrange all the vegetable and the pita bread on a decorative platter. Serve with hummus or your favorite dip. It’s so hot out today! How did you know Kathy? this is the kind of stuff that I am craving! And just think it wonâ€™t be long before all those Farmer’s Markets start appearing with all that wonderful fresh produce! yes ! with spherical cucumbers ! Hmmmm! Not in my neighborhood! My wife is looking for a veggie and dip dish exatly like the one you are using in your video. Could you please tell me where I can purchase one. Thanks. I am referring to the one with four sections plus a section in the middle. Hi Nick, The dip dish in my video is made by Fitz and Floyd. My sister gave it to me about 15 years ago and I am quite sure that particular style is no longer available. There are some fabulous dip dishes available at Crate and Barrel, Target, Pottery Barn, etc. They come in all shapes and sizes. Awesome video! I like where you said to make the slices small enough that there is no double dipping! If someone double dips I don’t go back for more. I make sure there is a spoon there so people know to put their dip on their plate. I should just make it more obvious with a “NO DOUBLE DIPPING PLEASE” sign next to it. LOL! I am heading to the recipe section for additional recipes. 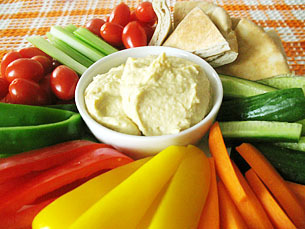 I have never had humus but will definately give it a try as a vegie dip. Thanks you for the info!!! How to make a great vegetable and dip platter. This video will show all the steps to put together a great vegetable platter as well as accompanying dips.